GULZAR’S Ijaazat lambasted the concept of live-in relationships. In the film, Naseeruddin Shah loved Anuradha Patel but married Rekha. Rekha handled the situation created by the ‘other woman’ with maturity and pragmatically as she believed in the old saying, ‘If you love someone, set him free’. Like most husbands in a similar situation, Shah made the best of both the worlds, until Anuradha died in an accident and wife Rekha not only left him and his house without his ijaazat, but also married Shashi Kapoor. Shah was left to rue the complications which were of his own making. He met the fate of a man who tries to sail on two boats. Gulzar gave a mature treatment to the eternal love triangle of pati patni aur woh. His mature touch was evident as the wife was not shown railing and ranting: "Usmein kya hai jo mujh mein nahin’, nor was there any violence or vulgarity in the film. Mera kuchh samaan tumharey paas padaa hai, woh bhijwa do... in the soul-stirring voice of Asha Bhosle left an impact. Rekha, Naseeruddin and Anuradha came out with emotion-loaded performances. N. Chandra’s Pratighaat opened with scenes of hooliganism orchestrated by a lumpen youth leader, Kali Prasad (Charan Raj). He committed murder and mayhem with impunity and graduated from one crime to another — smuggling, stealing, homicide and arson, etc. Lakshmi Joshi (Sujata Mehta), a college lecturer, took the bull by the horn and filed a criminal suit against Kali. In retaliation, he disrobed her in a street with all her neighbours and family watching helplessly. Lakshmi Joshi was rescued from the scene of public humiliation by Durga (Rohini Hattangadi), who had been raped by Kali’s men and her husband tortured to death. An honest cop (Nana Patekar) then joined Durga and Lakshmi. Together, they formed a three-man army against Kali and put an end to his villainous ways and life. Sujata Mehta breathed fire and brimstone in her role and lived up to the image of Durga, the mythological Goddess. Mahesh Bhatt’s kaash was a sensitive and sentimental melodrama of an estranged couple — Jackie Shroff and Dimple Kapadia — who fought a relentless legal battle over the custody of their only child — a son. The film took a dramatic turn when during the fierce legal battle, Jackie and Dimple, learnt, to their consternation, that the bone of contention — their son — was suffering from leukaemia (blood cancer). Flabbergasted, they buried the hatchet and jointly looked after the ailing child. Thus, in his death, the succeeded in bringing his estranged parents together. Jackie and Dimple gave intense performances that were straight from the heart. 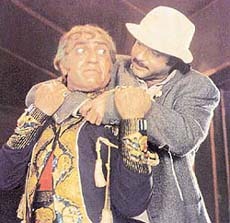 Rakesh Roshan made a successful directorial debut with Khudgarz, in which Jeetendra and Shatrughan Sinha played best friends despite a yawning economic divide between them. They stood by each other through thick and thin. Unfortunately, a blow to Sinha’s self-respect and dignity terminated the friendship. Friends turned into foes. Sinha became obsessed about becoming a richer man than his erstwhile friend. Little did he realise that his much-maligned and castigated friend was always silently backing him. Singithan Sriniyas Rao’s Pushpak was an experimental silent film laced with black humour and satire. Kamal Hassan was shown as an unemployed youth who dreamt of becoming a millionaire, but his room was decorated with posters of Rambo and Karl Marx. The message and meaning of the film was conveyed in the last scene, when the body of a beggar, who had died on a pavement, was lifted by the municipality people and some currency notes — his life-long savings — flew out of the rags and were trampled over by the traffic on a busy road. Kamal Hassan and Amala lent credibility to the most complex scenes by emoting effortlessly, without the use of words. Vijay Mehta’s Pestonjee was a psychological portrait of friendship between two Parsi friends — the extrovert Pestonjee (Anupam Kher) and the shy and introvert Piroj (Naseeruddin Shah) and traced their relationship after the seductive Jeroo (Shabana Azmi) comes into their lives. Shah brought the character of Piroj alive and won accolades for this landmark portrayal, which made him an idol of the intelligentsia.